Men suffer from just the same natural ageing processes as women. 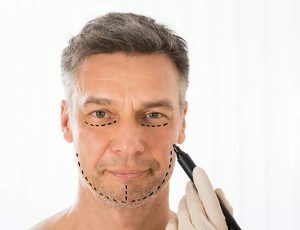 It is, therefore, no surprise that as we see the male population taking more pride in their appearance, many are turning to cosmetic facial surgery to help bring back a more youthful, rejuvenated appearance. At the Wentworth Clinic, we offer a range of male facelift procedures to help make you look as young as you feel, reducing fine lines, wrinkles, and other signs of ageing. It is important to be realistic about what is possible to achieve from a surgical facelift. Men who wish to address fine lines and wrinkles around the lips and eyes, or the condition of their skin, should consider additional non-surgical procedures since our facelift addresses the mid-face area only. Additional treatments that would benefit these areas include laser resurfacing, and hydrodermabrasion. Our Consultant will advise on the best treatment plan for your particular needs during your initial consultation. External bruises and swelling usually will subside in 2 to 3 weeks. If you have persistent bruising, make up will cover this until it subsides. Internal bruising and swelling may take 6 to 8 weeks to heal. In most cases, this is only obvious to the patient. The face and neck may feel “rigid” or “tight” during this time, especially in the neck and cheek areas. This will ease with the course of time, this is usually not obvious to others. Severe pain not responding to medications. Marked swelling or obviously more swelling on one side that the other. If your bandages seem too tight. This is, in general a safe operation. However, some complications must be considered. Although the incisions heal well, the possibility of excessive scarring must be considered. The nerve responsible for moving part of the face can be damaged, causing paralysis of the affected muscle. Bleeding, infection, loss of skin or hair are other possible complications. Numbness of the ear lobe is another possible complication as a result of damage to the nerve. Your surgeon will discuss this with you in detail at your consultation. How much does a Male Facelift Cost? Since we offer a range of male facelift surgeries, the cost is be dependent on complexity of the facial surgery. All our facelift procedures start at £4,000. Once we have carried out our first consultation then we will have a better understanding of the procedure required and will then be able to provide a more specific quote.